If plundering the past for vintage pieces is not your thing and you’d take a clean line over a rustic finish any day, the contemporary look is for you. 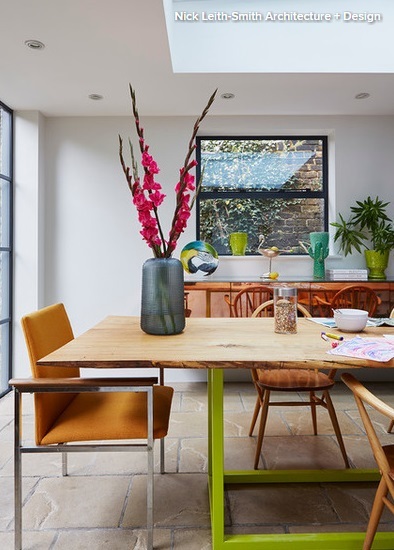 As the name suggests, it’s rooted in the now, using the latest on-trend materials, bold colours and sharp styling to create a home that feels exciting and original, personal without being cluttered. Try these style shortcuts to help you get the look. Contemporary homes embrace the darker side of the colour spectrum, using deep greys, blues and even black in bold and ambitious ways. 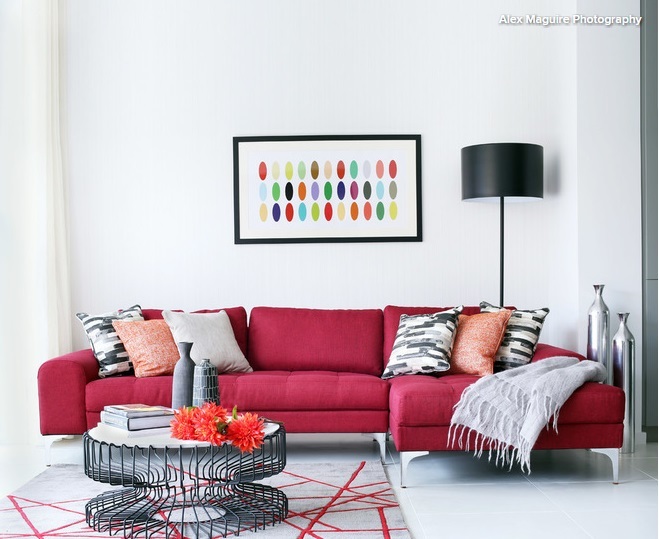 These strong colours are often used to decorate entire rooms rather than simply as an accent, and bring instant drama to light-starved or featureless spaces. Teaming an inky backdrop with a jewel-bright sofa or some warm, reflective brass is another smart contemporary shortcut. 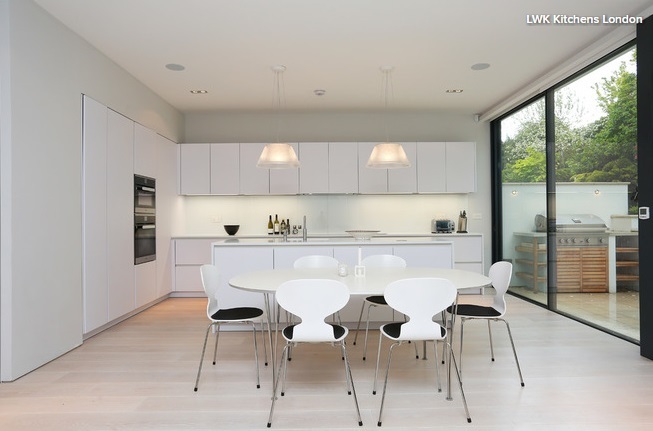 Sticking to an all-white scheme is as bold as using strong colour and creates the same kind of impact. It’s also a simple way to pull off a crisp, contemporary look. It works brilliantly in a kitchen, creating a clean feel and helping tall furniture blend in almost seamlessly. A contemporary scheme is all about the now, incorporating the latest technology, clever innovations and exciting materials. Some classic materials, such as marble, brass and copper, are enjoying a style revival at the moment, and are working their way into contemporary schemes in less-than-obvious ways. 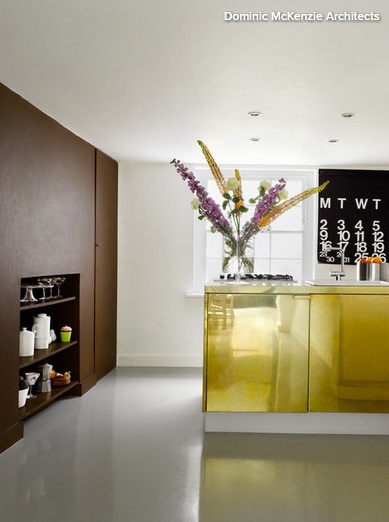 This kitchen island is clad in highly polished brass sheeting, for example. Contemporary spaces delight in mixing materials to create visual variety without the need for lots of clutter or collections. Here, shiny copper makes friends with rough stone flooring, while the warm wooden furniture is framed by black steel windows. 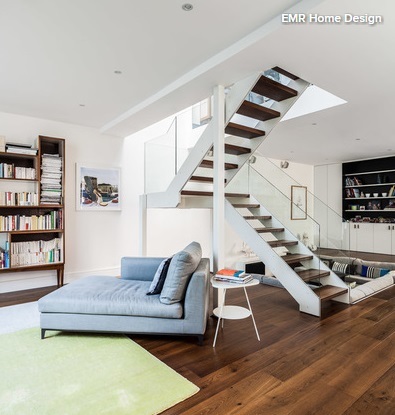 Contemporary schemes are sleek, ordered and smartly designed, but not necessarily minimal. There should be space to display treasured pieces, on freestanding or bespoke shelves and furniture, so the room feels personal but never cluttered. Try this simple shortcut to create a contemporary look with heart – introduce a little warm wood. It works beautifully against a dark backdrop and its rich natural tones and soft grain help to ground a clean scheme, steering it away from feeling stark or austere. Furniture designed with clean lines that cuts a crisp silhouette will bring a contemporary edge to any space. In a living room, think seating that stands smartly on stiletto-sharp legs and has neat upholstery. Then team it with a low table made with eye-catching angles, and a generous standard lamp that creates a crisp silhouette against a plain wall. When it comes to built-in furniture and fittings, bring in contemporary style with designs that work hard but look sleek and understated. 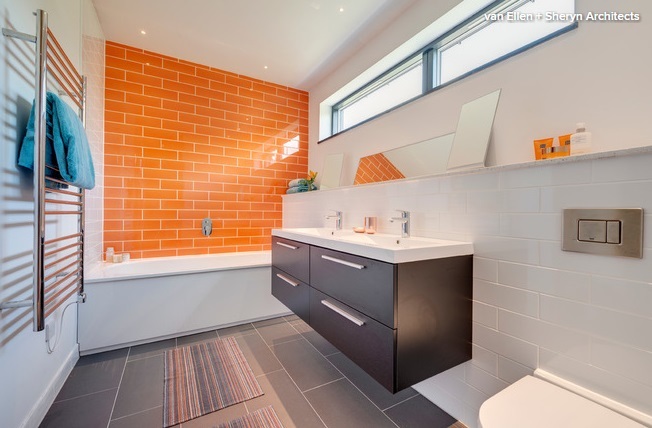 In a bathroom, for example, choose wall-mounted cabinets, simple handles and bold, graphic tiling. 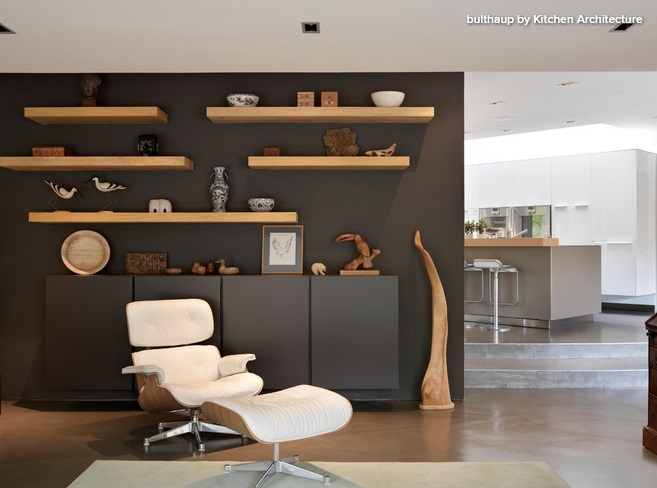 Working in a mix of light sources is something modern homes do well. Combining pendant lights of different sizes with floor and table lamps, and perhaps some recessed spots, too, creates visual interest, whether the lights are on or off. 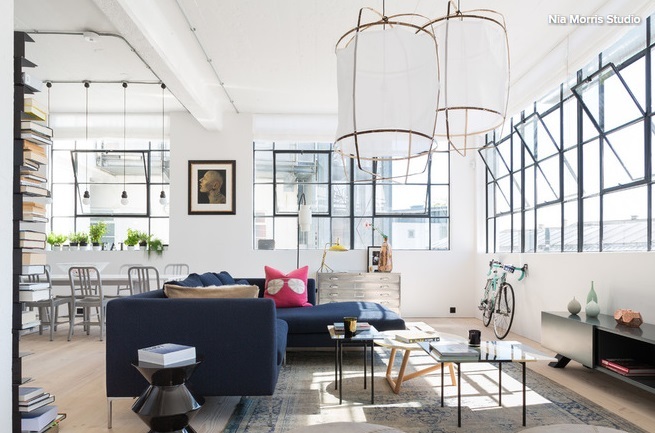 It also helps to zone an open-plan space and produces mood and task-appropriate light levels that allow you to work, rest and play. 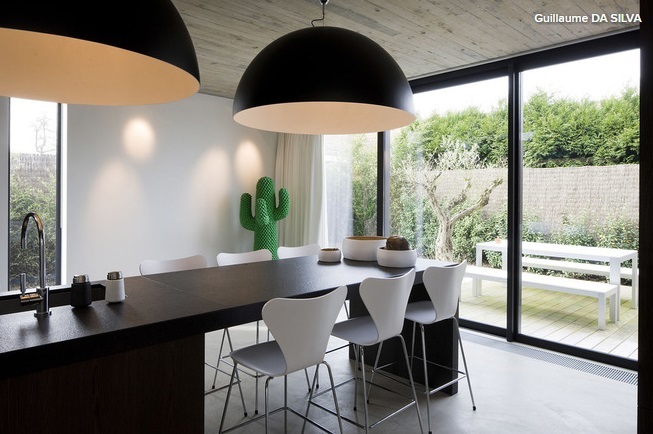 Try hanging some showstopping pendant lights – a confident contemporary scheme will often include one or two. Play with scale and choose something oversized to light a table or zone a dining space, or hang a cluster of lights or a modern chandelier for a more layered look.